When I ran across a recipe called "World's Greatest Cookie" I was skeptical. In fact, one of the first things I thought of was a scene from the movie Elf where Buddy sees a sign advertising "World's Best Cup of Coffee." and rushes into the store to congratulate them. Still, even though I knew these weren't actually the world's greatest cookies, I filed away the recipe because I figured they had to be somewhat good for anyone to make such a bold claim. When I finally baked a batch, I was surprised at how great they really are. Given the unique list of ingredients (corn flakes, oatmeal, AND coconut?) I wasn't sure what they would taste like. In fact, I offered one to my husband and when he asked me to describe them all I could say was, "Ummm, good?" Since he is always accusing me of tricking him into eating foods he doesn't like (and because I always am) he nibbled at the cookie a bit before he ate it. Then he asked for another. The closest description either of us could come up with for the flavor was something like a pecan sandy cookie. 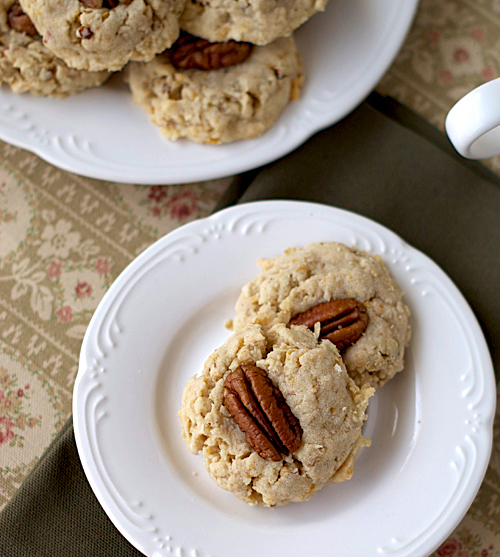 It's shortbread-like and there is some nutty flavor to it. The corn flakes add such an amazing texture to the cookie that I'm going to try to incorporate into other cookie recipes. The coconut and oatmeal just added a touch of flavor and texture and were not overpowering at all. In fact, I wouldn't have guessed that either were in the recipe just by tasting it. I had planned all along to re-name the recipe something more descriptive when I shared it, but I ultimately decided not to. For one, I couldn't come up with another name that described their flavor, and for two, if the name was enough to make me curious enough to make them, I'm hoping it will do the same for you. It might not be the world's greatest cookie, but it is a darn good one. Preheat oven to 325°. Line 2 or 3 baking sheets with parchment paper. Set aside. In a large mixing bowl and using an electric mixer at medium-high speed, beat the butter, sugar, and brown sugar until light and fluffy. In a medium bowl, whisk together the egg and oil until combined. Add oil mixture to butter mixture, and beat at low speed until well combined. Add the oats, cornflakes, coconut, and almonds, and beat until mixture is well blended. Reduce mixer speed to low, and beat in flour, baking soda, salt, and vanilla extract. Drop by spoonfuls onto prepared baking sheets. Garnish each spoonful with a pecan half, if desired. Bake for 8 to 12 minutes, or until golden brown. Cool for 10 minutes, then transfer to a wire rack to cool completely. Pecan Sandies are not the best cookies, but homemade I'm sure they beat the store bought out of the water :) Also, I agree, cornflakes are a fantastic secret ingredient. I saw a recipe for cornflake chocolate chip marshmallow cookies that I REEEEALLY want to try! I love that scene in Elf! 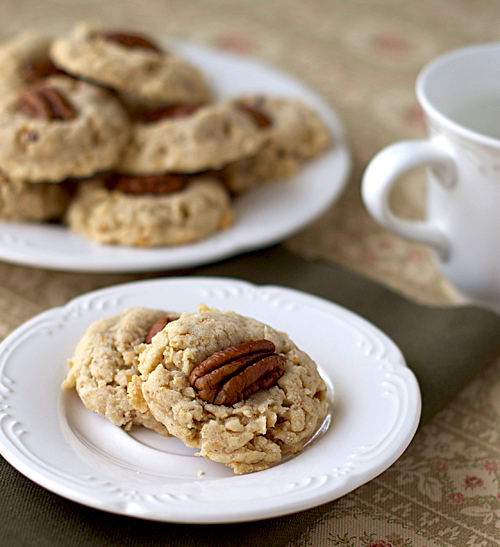 These look so yummy, I love pecan anything! Well, of COURSE with a title like that, I had to come over and check these out! They look very interesting, indeed, Nicole. Have a great week! Ok, now I really want to try these! Sounds good! Any cookie with all those fabulous ingredients is definitely a "world's greatest" in my book! They look delish, Nicole! It truly looks like the worlds greatest cookie. These cookies look great and great to share! i made these a few weeks ago and my father (who loves to eat cookies) said they were sinfully good! thank you for posting this recipe, I will be making them again this summer for my significant others family. (so you know they must be good).